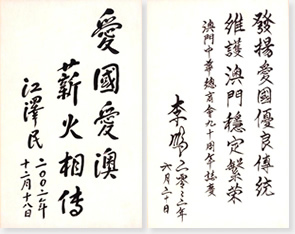 To support the principle of "one country, two systems", to be persistently devoted to the country and Macao, to unite different entities and individuals in the industrial and commercial sectors in Macao, to server them and safeguard their legitimate rights and interests, to promote the commercial links with other countries and regions, and to strive for the social stability and economic prosperity of the Macao Special Administrative Region. A 5-member delegation led by Mr. Luo Yiming, Deputy Chairman of Jiangsu Provincial Committee of the CPPCC, visited the Chamber. Mr. Yang Jingwei, Deputy Director of the United Front Work Department of Henan Provincial Party, visited the Chamber along with his colleagues. Mr. Xu Ze, Vice-Director of the Central Government Liaison Office in Macao, visited the Chamber with other representatives of the office. The office-bearers of the Macao Federation of Trade Unions visited the Chamber. A 6-member delegation of Guizhou Sub-Council of CCPIT led by Vice-Chairman Wu Bing visited the Chamber.